Looking for some inspiration? Than look no further than our favourite success stories, who are leading the fitium revolution. Have you ever had a moment of clarity… where you thought that enough is enough? For Kathryn, this moment came as she was feasting at an all you can eat pizza buffet. 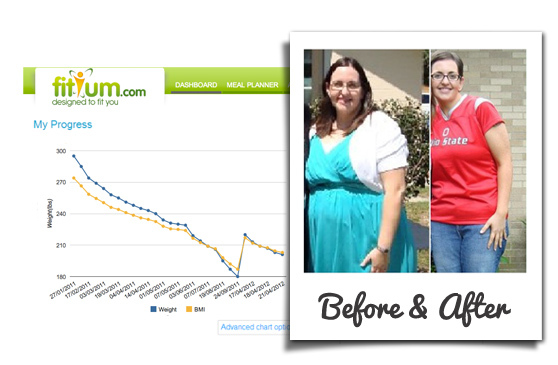 She took massive action and within 9 months lost an astonishing 120lbs, and now feels great! “At my heaviest I was just over 300 pounds after my son was born. Eighteen months later no better. Before he was born I was still tipping the scales at around 275. I was obese as a child and all of my adult life. A balanced diet came first with a doctor’s visit to make sure I was going to do this the healthy way. She told me to write down what I eat and keep a log of how much I weigh from week to week along with what I ate. Look at small goals as well as big goals. Fitium.com was a huge tool in my weight loss. 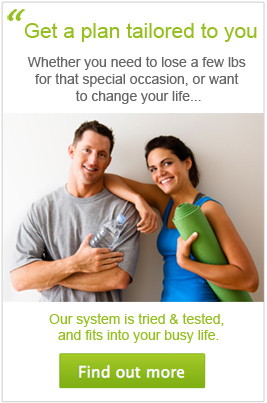 It helped me to tangibly see my goals and track my diet and exercise. Unlike notebooks where I’ve tried to keep a log in the past I couldn’t lose it and by making my homepage as a reminder I couldn’t lose. After the first month I could see the line going down towards my goal weight I wanted it even more. So I added exercise. The diet evolved as I made small changes towards fresh fruits and veggies and whole grains. I measure everything I eat and portion control is essential. I also take a multivitamin and split my meals into 6 smalls ones throughout the day. I lost 120lbs in 9 months and have maintained that for almost a year now. Weight loss is hard, but not impossible with the right tools. We are strong believers that you can beat a pre-disposition for weight gain, and John is a perfect example. After battling with his weight throughout his life, John decided it was time to change and take control. Since joining fitium, and through a combination of the right diet and the right attitude, John has lost nearly 30% of his body weight, and transformed his life! “I have struggled with my weight from a very young age thanks to the fact that I adored sweet food. As a result of the excess weight I was never really interested in sports so as a young teenager my weight increased at a steady pace. My parents were naturally concerned and encouraged me to do all sorts but by this time it was too late, I quite happily settled down into the viscous circle of eating to make me feel happy, feeling sad because I was overweight and then eating more to make me feel happy again! I tried many different diets and regimes however none of them worked until I actually decided enough was enough. As a very visual person I needed something that I could track my progress on, something that would initially demonstrate how overweight I was and something that would demonstrate my results in a positive light and really show my progress. I found Fitium.com and it was perfect for me. I would regularly sign in to update my weight and I found it exceptionally motivational watching my weight gradually reduce along with my BMI. I made a life decision to eat healthy, simply cutting out the rubbish from my diet. Three satisfying meals a day, with plenty of water to condition my system, and no calorie counting or diet fads! 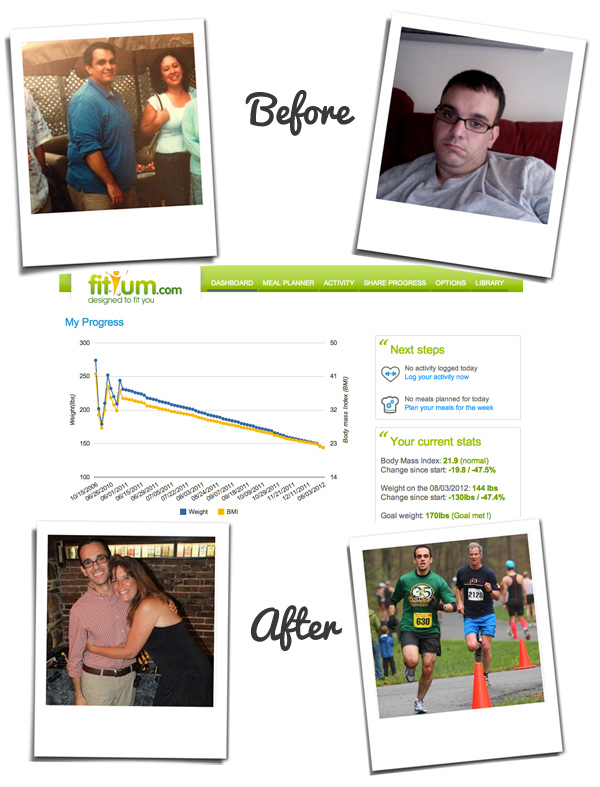 Joe has lost an amazing 130lbs in total, and has completely transformed his body.When he joined fitium he lost over 90lbs within 7 month, and has continued to build on his results. 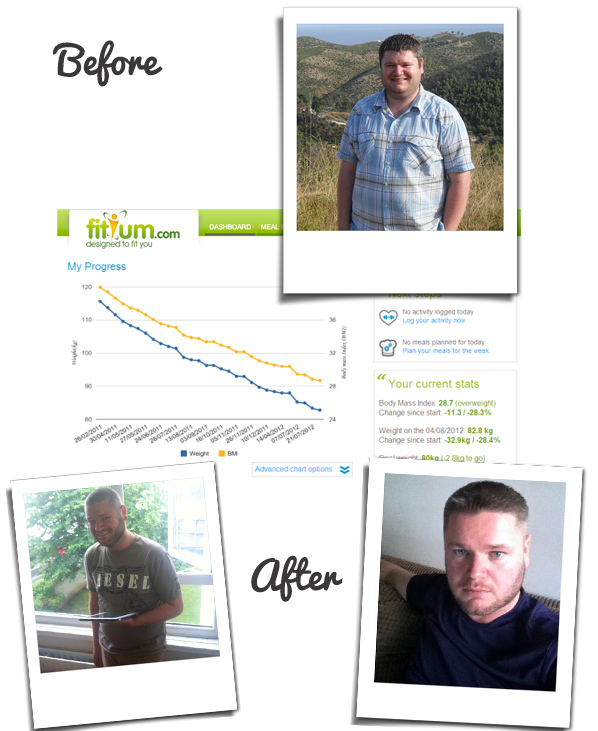 Fitium.com was an integral part of my weight loss. The visualization of my progress through the charts on the site really motivated me to keep going. I’ve lost 130 pounds, from 275 to 145, my BMI is down over 47%. This was accomplished through diet, exercise, and the will to succeed. I’m currently training for the Marine Corps Marathon in Washington, DC. My health and fitness is now my top priority, and with Fitium I can stay on track, hold myself accountable and accomplish my goals. Are you ready to take your body to the next level? Then click here to join us today. Disclaimer: We do not claim that these are typical results that everyone will achieve. We share these testimonials to inspire and to provide you with an idea of what is possible. Remember that what you put in is what you get out.